Earlier this week, I released WPUnlimited, a new WordPress theme system that I hope everyone will enjoy. While I am talking about it endlessly elsewhere, I wanted to cover one of the key differences that I think coders will really enjoy in using WPUnlimited: traditional theme files. So you might be asking yourself why traditional theme files is important or worth mentioning, but one of the issues I have always had with Thesis, a theme I enjoyed was the fact that opening header.php didn’t really give me a normal WordPress header.php theme file. It was just a call to another PHP file, making the whole customization aspect a nightmare for a beginner programmer. Just that one line… no mention of includes for headers or footers, no loops, nothing. This leaves someone looking to customize how posts are displayed with the horrible task of digging through files to see where that PHP code is, and how they can manipulate it. WordPress Unlimited’s theme files look very much like you’ve seen since the Classic theme was created, with easy to understand header, footer, and index pages that makes editing the theme easy for anyone immersed in WordPress already. As a side note, WPUnlimited also has a great affiliate program, so if you enjoy the theme, I’d love it if you passed it on to your friends, and earned yourself a 40% commission on any of your sales. Even if you don’t buy WPUnlimited, you can sign up for the affiliate program. 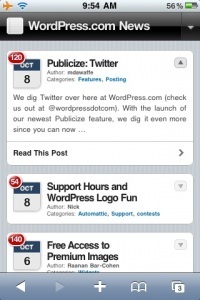 Check it out, it could be a great opportunity to promote the next amazing WordPress theme. This entry was posted in WordPress on February 26, 2009 by Admin. So if you follow WordPress news at all, you may have heard about a crazy thing happening right now where Automattic removed around two hundred themes from WordPress.org’s theme directory. Many of these themes were removed as they didn’t fit with Matt’s vision of the GPL. Some themes were released freely, under the GPL but were really a promotion and marketing effort for companies looking to sell themes. I didn’t have any problem with this, but it seems that Automattic does, and themes that linked back to companies that sell themes that aren’t under the GPL were removed to “protect” WordPress users. I think this is ridiculous. I, for one, am glad that I use custom themes, and Thesis, a great premium theme. I wish that Thesis was able to be part of the WordPress theme directory to take advantage of the update and upgrade system now in WordPress core, but since Matt doesn’t agree with their business model, he punishes them directly. Matt blames theme creators for not thinking creatively when it comes to building a business around theme development, but if he keeps cutting off their arms when they try to find ways to build a business, eventually, they will give up and move on to something that gives them a better return on investment regarding their time. Maybe this issue will become the seed of a new mass exodus to another publishing platform? Do I hear Habari waiting in the wings? I’ve been told numerous times that Habari will let theme developers easily build a business around their themes for that platform. This all wouldn’t bother me so much, except that Automattic is making huge boatloads of money off of WordPress and that is in large part thanks to all of the community support the platform gets. This entry was posted in WordPress on December 16, 2008 by Admin. 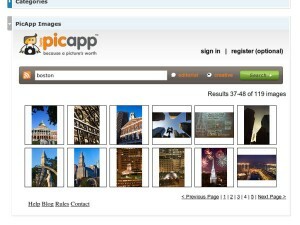 Their understanding of the niche they were trying to fill was part of the reason they didn’t need me sticking around as their Community Manager and I am happy today to announce that they have launched their WordPress plugin for PicApp. Even better, it is in the WordPress.org Plugin Directory, so it will be easy to keep track of any updates and over one thousand people have already downloaded it. Having hard time finding affordable, yet high end, images for your blog? problem solved. Access millions of updated images, of any topic (news, celebrity, sports, events, creative and more) directly from your WordPress environment and add any image easily to your post. The images, legal and free to use under the license terms, will enhance your blog content, improve its SEO and attract a significantly larger readership. Moving PicApp from a destination site where you have to do everything, and bringing it inside the WordPress administration panel is genius, and PicApp deserves huge kudos for doing this. If you haven’t given PicApp a try before because you felt it took too long to add the images you wanted to your blog, check out the new PicApp WordPress plugin. This entry was posted in WordPress on December 13, 2008 by Admin.